Dog Walking Rosebank Johannesburg – It was a cool morning to be walking today, but the dogs didn’t seem to mind at all. The walkers fetched the three German Shepherds, Penny, Zorin and Tawnee, and went on our way. Until we changed route after meeting another man walking his dog, who was very happy to have the company. He was very chatty and enjoyed seeing this wonderful pack of dogs. We then parted ways and continued with the morning stroll. Penny is very calm and collected, and walks at a steady pace. Tawnee always likes to know what’s going on in her surroundings. Zorin is the young, curious type, and always finds new things to sniff. It was a chilled walk with the three, who were quite tired when they got home. Although German Shepherds made their way to the United States before world war I, it wasn’t until the war that the breed became popular in the U.S. Allied servicemen noted the dog’s bravery and intelligence, and a number of dogs went home with these soldiers. Although the Allies were impressed by the German dogs, they weren’t so happy with the dog’s German roots. During wartime all things German were stigmatized, and in 1917, the American Kennel Club (AKC) changed the breed’s name to the Shepherd Dog. 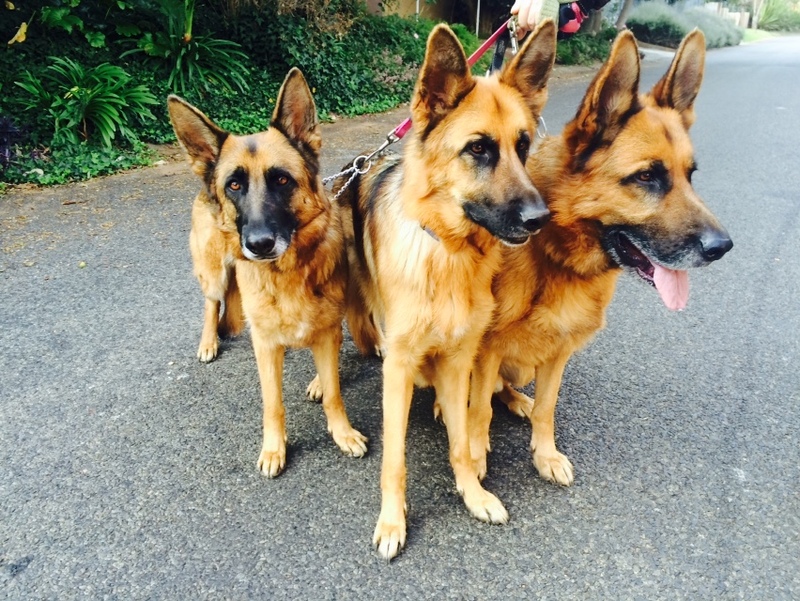 This entry was posted in Dog Walking and tagged #YourHound_SA, Alsatians, city streets, Dog walking, dogs, Early mornings, entertainment, exercise, fit, fun, Germna Shepherds, Happy Dogs, healthy, Johannesburg, Pets, Rosebank, Socializing, Sunny Johannesburg. Bookmark the permalink.